It’s time for another SUO challenge and this time the theme for the challenge is Marker Fun! Well…what can I say…anymore when I think of markers…I think of Blendabilities! LOVE these! What is so amazing about this is that it actually does make it look like I can color. When I was trying to figure out what image to use, Partridge & Pears just sat there saying ‘chose me’! How delightful to color it in with the Blendabilities! Sweet Taffy (Old Olive dotted print) – 3/4 x 5 1/2 and add to card base. Real Red – 3 3/4 x 5 1/2 – run through the On Pointe Embossing Folder. Gold Glimmer – 1/2 x 5 1/2 – add behind Real Red panel and add to card front using dimensionals. Whisper White – Cut out using Part Pennants Die. Stamp tree using Memento Black and colors using Old Olive, Crumb Cake, Daffodil Delight, Cherry Cobbler and Smoky Slate Blendabilities. Hello Honey – 5/8 x 2 3/4. Stamp greeting using Memento Black, cut into a banner and add to card front. 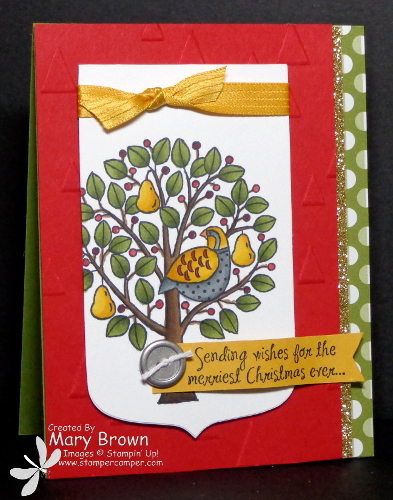 This entry was posted in Blendabilities, Holiday Mini, SUO Challenge and tagged Partridge & Pears. Bookmark the permalink.